"A woman inspired by a man of dreams swept into the arms of a general, and drawn into a worlds of danger." 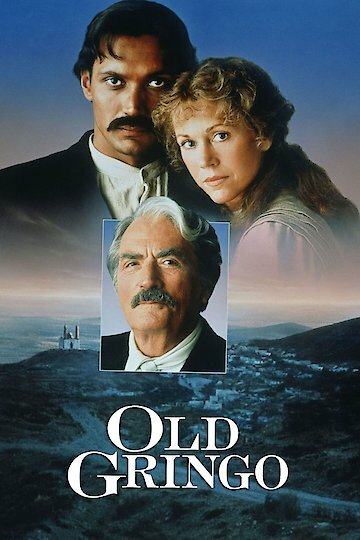 Old Gringo (starring Jane Fonda, Gregory Peck, and Jimmy Smits) is an adventure, history, and romance film all rolled into one that was released 1989. This film is about a school teacher, Harriet Winslow, who goes to teach children in Mexico. But disaster strikes when she is kidnapped by a man called General Tomas Arroyo and his fearsome followers. The "Old Gringo" Ambrose Bierce befriends the kidnapper and subsequently meets Harriet. Unknown to those who know him, Bierce is a famous writer whose body is being ravaged by disease. Spending his last days in Mexico, he keeps his identity a secret. This man continuously provokes the anger of the dangerous General in the hopes of prematurely dying at the General's hand. The woman, intrigued by both of these interesting characters, soon discovers that these men are attracted to her. Later, she becomes romantically involved with her captor. Eventually, she learns the identity of the mysterious Old Gringo and vows to relieve him of having to experience a slow, painful death. Old Gringo is currently available to watch and stream, buy on demand at Amazon, Vudu, Google Play, FandangoNow, iTunes, YouTube VOD online.